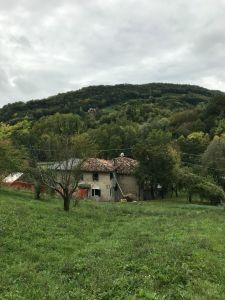 For sale home consisting of a nice portion of rustic to renovate without heating of about 130 square meters with agricultural land with forest of about 7,000 square meters in part flat and partly hilly. The house is on three levels and consists of: on the first floor from which you can access directly from the outside living room kitchen with fireplace and double bedroom: the first floor bedroom, bathroom and attic room to be used as a bedroom or study. On the ground floor cellar; small annex composed of a storeroom on the ground floor and on the first floor. The entrance of the house can be by private road (to be built) or entered from the common courtyard. Sunny position exposed to the west. The house is suitable for those seeking tranquility with nature, I want to keep animals, or make the garden with private vineyard. Also suitable as a second home for the weekend.